I bought a 1 ton truck for parts. Basically needing a new hood since I messed up mine. When I first looked at the truck I thought it was a 96 by the dash, then I remembered a 95 has the same dash as a 96. I popped the hood, this is when I realized it was a 95, it has a TBI™ 454 set up and not a vortec. Yes I am a little disappointed that it wasn't a vortec. But it is not the end of the world that I know of. I think the TBI™ engine block is a GEN 5. I will have to do some investigating to see if this engine has a hydraulic roller or not. Also see if the engine has the six bolt front cover. Cngrats on the new truck!! Well, I did some research, at least with the gen 5 engine it has a 4 bolt main block, I will see for sure later. The heads are not so good, hydraulic cam, but that can be upgraded with the heads. The front timing cover is a 6 bolt which means and fingers crossed that the vortec front cover will fit so I can use the crank sensor that I will have to install. also, the dampener will need to have some metal removed or just buy one for a vortec 454. Now I just need to put money away for this just like I had done for the transmission. Start collecting parts. I am disappointed that it is not a vortec. I would have everything needed for the swap. Now I will need an intake, a different throttle body. Not sure if the radiator that I had purchased will cool the 454. Even though it is a three core rad. It isn't as tall as the 454 radiator is. It would be cool to win the lottery right now, then I could take some time and actually rebuild this truck. The fun part would be to swap in a better computer system that what the TBI™ has. than I can find and put in another 4L80E with a 241 transfer case, that is not with the truck either. But I am getting a head of myself with wishful thinking. One thing I did say when I first started on here was to see what the actual difference between the 9 1/4 front diff, and the 8 1/4. I now have both. Just the one is a 95. I think there was a case upgrade, making it a little beefier in spots. I have gotten a lot of useful information off of here and another site that I cannot get on anymore. Thanks for all the wisdom and support. The 95 would be a good candidate for the SAS swap. I am stealing the hood for my truck for sure. This truck has a flat deck on it. The one question, that plaques me is, will the brackets off my small block fit on the 454. such as A/C, power steering, and the alternator? This truck has the older style A/C unit. It would be cool to win the lottery right now, then I could take some time and actually rebuild this truck. Brother, that is the truth!! It sounds like you have some cool plans - now the time and the money come into play. All of your projects are well thought out and I enjoy seeing your builds. Very much looking forward to this. 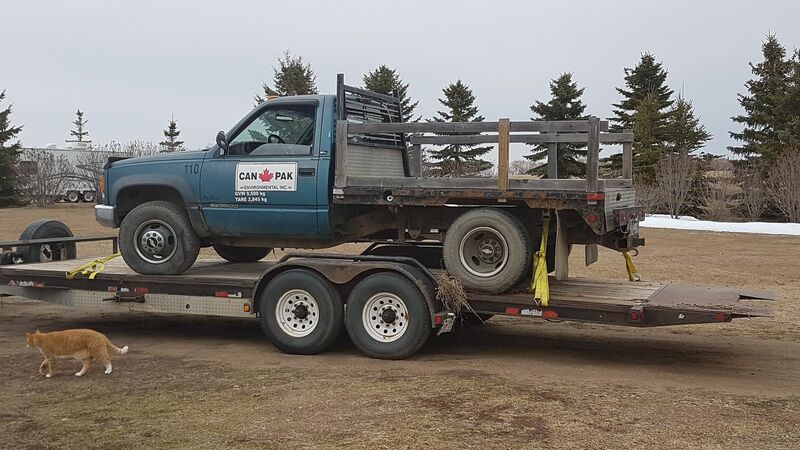 Here is the truck I bought. Looks like a farm truck - I like it. You seem to be set against TBI™ and I'm sure you have your good reasons. But to me the simplicity of TBI™ is just so appealing. You seem to be set against TBI™™ and I'm sure you have your good reasons. But to me the simplicity of TBI™™ is just so appealing. Not really, I have the EFI Live Scan/Tuner that works with OBDII set ups. It is easier for me to swap a tune into a 0411PCM. I still need to get a transmission. This truck is all set up for a clutch, so a nice 5 speed would do, plus the NP241 transfer case. Then again, maybe just putting a carb on top a new intake with a holley carb. Get an HEI distributor too. I like the fuel injection for going in the mountains, because it adjusts your air fuel ratio. I was told this truck would die on you and it was very hard to get started again. I see someone has changed some of the wiring, not really sure how bad it is butchered. It's been a while so I may be wrong, but as I recall the intake ports on those mid-90s 454s are so small you can get your thumb stuck in one. I'd plan on replacing the heads if you want power out of this. GM has a bad habit of sabotaging stuff they no longer want to make, like how they want to make FWD sedans but not RWD sedans, so when forced to sell them they overpriced them and limited available options to all of them whether you wanted them or not. 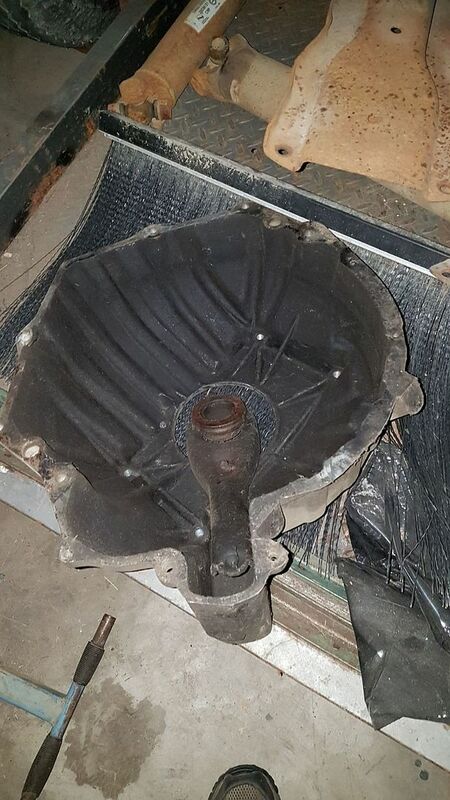 I have the bellhousing, no pressure plate or clutch, the flywheel is rusted, will need to be turned or get a new one. I still have the crossmember, along with both drivelines.